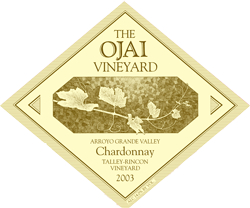 Always our biggest and richest chardonnay-this 2001 does not disappoint. Meticulous farming and ideal growing conditions gave us a Talley-Rincon of unusually good balance. The natural acidity in this year’s wine gives a freshness and drinkability that is uncommon for this vineyard. Talley-Rincon always displays an aroma of Bartlett pear, and, this year, it is quite pronounced. A classic..